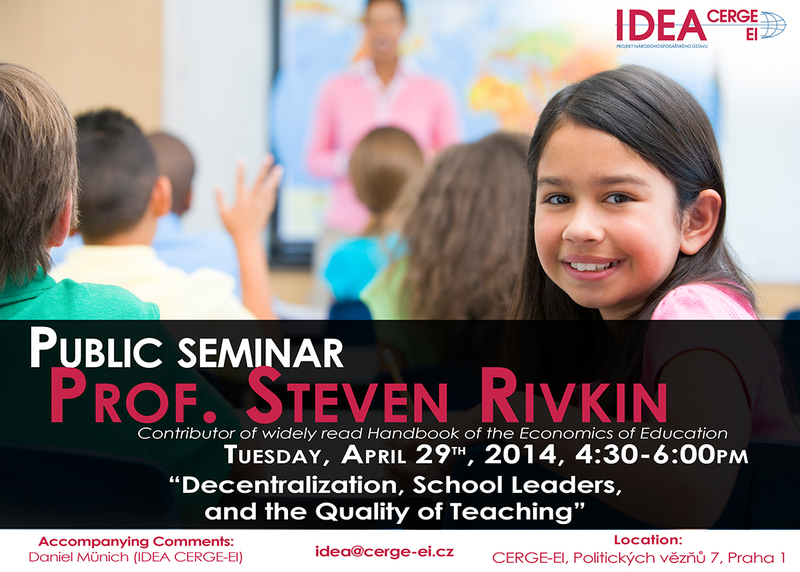 On April 29th, 2014 CERGE-EI and think-tank IDEA organized a special lecture with Prof. Steven Rivkin titled “Decentralization, School Leaders, and the Quality of Teaching”. Dr. Rivkin is Professor of Economics and Head of the Department of Economics at University of Illinois at Chicago. He is also Associate Director of Research with the Texas Schools Project at the University of Texas at Dallas, Fellow at the National Bureau of Economic Research, and is a part of the CALDER Texas team. He was also a post-doctoral fellow in the NSF urban poverty program at Northwestern University. Why do principals have a big effect on the quality of teaching? Does decentralization elevate the importance of principals? When are principal evaluations of teachers effective at raising the quality of instruction? Why do so many evaluation systems fail to provide fair and useful ratings and information?